Since I slacked off the other day and missed my Wednesday slot, I was fortunate that Jeremy filled in. So, here I am to take his place for Friday, while he is off fishing for walleye. Last year, Perdomo revamped their Habano line, giving the new blend wrappers aged in bourbon barrels, and well-aged fillers from Nicaragua. The three wrappers – Connecticut, Maduro, and Sun Grown (which replaces the Corojo blend) – all surround the same filler material, and come in five sizes: Robusto 5 x 54, Epicure 6 x 54, Torpedo 6 ½ x 54, Churchill 7 x 54, and Gordo 6 x 60. Prices run from $7 to $8.50. The other sizes that previously existed in the line have been discontinued due to slower sales and a desire to concentrate on the core vitolas. Thanks to Ken Kuhr from Perdomo for confirming that info. Having a longtime fondness for the old Habano Maduro, I decided to pick some Sun Growns up from the good folks over at Cuenca Cigars. The Perdomo Habano Bourbon Barrel Aged Sun Grown is draped in a yellow tinged milk chocolate brown wrapper with light to medium veins, a slight oily sheen, and a firm pack down to the foot, where there is some softness. The roll is nearly seamless, and it is finished off with a nice deep double cap and ornate banding featuring a color scheme of various shades of brown plus white, black and shiny copper, with the foot band designating it as Sun Grown. The wrapper gives off a bright, tart barnyard scent with a bit of woodiness, while the foot shows rich tobacco and earth. An easy clip of the cap reveals an ideal draw, but the unlit flavors are pretty fain, showing not much more than tobacco and leaving some spicy tingle and a bit of saltiness on my lips. Note to self: Remember to remove the foot band, dummy! Fortunately, I realized that before the flame hit the stick. The Perdomo Habano Bourbon Barrel Aged Sun Grown immediately starts off giving up a copious amount of smoke on the draw, showing that rich tobacco, earth, and oak, with a sweet spice playing in the background. An initial hit of pepper on the tongue quickly died off, resulting in a very smooth entry, but it is definitely there to scald your sinuses on the retrohale if you’re not careful. The burn line has started out a little thick and uneven and the ash has unexpectedly dropped on me after a little more than a half-inch in, which is something that did not happen with either of the two that I had smoke previously. I suspect that the slight underpacking of the foot has something to with that. The oak has gained a nice smokiness to it, and I am really enjoying the way the increased sweetness hits my tongue on the entry, while the pepper has returned as a flavor component rather than a bitey sensation. The Habano Bourbon Barrel Aged Sun Grown finishes off its initial third at a solid medium in body with no nicotine strength. The sweetness of the first third has backed off in the center portion of the cigar, but the other components remain, while picking up a bit of coffee bitterness. Yeasty bread notes also begin to show, and the ash continues to be rather weak and soft. In the final third of the Perdomo Habano Bourbon Barrel Aged Sun Grown, the pepper has resurfaced, mostly on the lips and aftertaste and the smokiness of the oak has turned to a bit of char. Although the sweetness has receded, there is still enough of it there to be noticeable on the palate. The body has ramped up to nearly medium-full and there is an emergence of nicotine strength into the medium range as the cigar smokes down to the last inch, finishing cool and firm. I really wish that the final third of the Perdomo Habano Bourbon Barrel Aged Sun Grown had been in keeping with the first two sections of the cigar, but it wasn’t a deal killer at all. 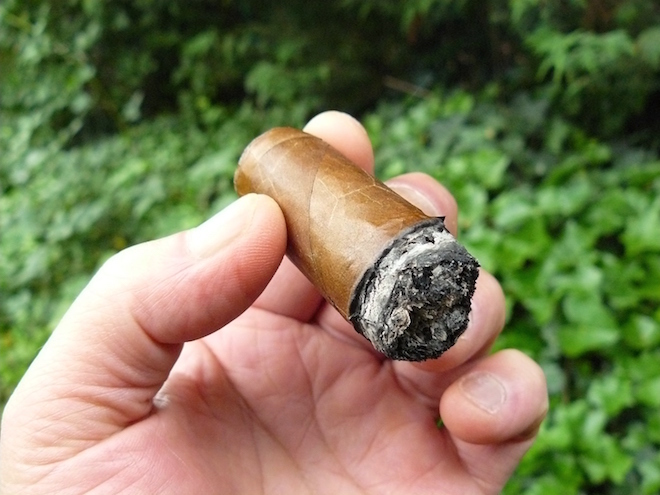 While I did have to give it several touch-ups, they didn’t impact the flavors and in some cases actually helped, but the first two cigars I smoked leading up to this review didn’t have the burn issues that I experienced with this one. Overall, I found the construction to be very good and the flavors enjoyable, with the price being in line with the quality of the cigar. I look forward to picking up on and trying the other two blends of this line in the future, particularly the maduro version. 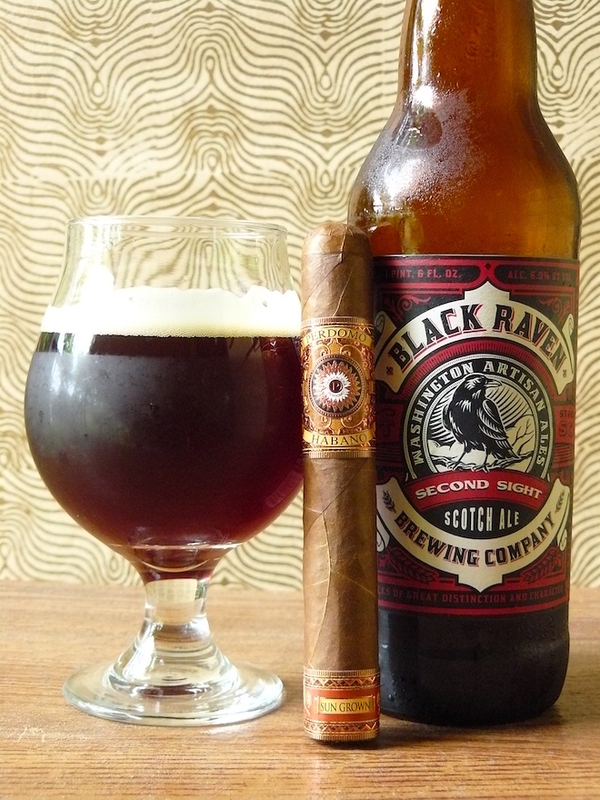 The Second Sight Scotch Ale from Redmond, WA brewer Black Raven is a somewhat lighter version of the breed, with a light mouthfeel showcasing a medium sweetness surrounding faint chocolate, prune, and caramel, with a wisp of smoky peat. While it’s not my favorite style of Scotch ale, its overall profile actually matched up damned well with this cigar. A sweet rum would also be a great way to go with it. Have you had any more of these since? Any further burn issues? I have not had any since, but plan to soon. I will post about it here when I do. Like I said in the write up, though, I didn’t have any problems with the others I smoked. Thanks for the read. I’m smoking another one now, and I am having no combustion issues. The flavor components are pretty much the same, so I think I can safely say that apart from the burn, everything is much like it appears in the review.. In fact, the final third is doing much better in terms of flavor, with the sweetness hanging in there. I quit with about an inch and a half to go. Enjoyed it a lot. For what it’s worth I had no burn issues at at. Draw was great as well.